God sure does have a clever sense of humor, wouldn’t you say!? Here’s how I know: I’m dating a faaaaantastic man who… doesn’t know the difference between a pie and a cake… a muffin and a cupcake. Funny, right? This has to be a joke… right? Me: Simon, what do you want for your birthday? Me: A pie? You mean you don’t want a big ol’ chocolate cake? Simon: Oh! Wait! No…. I want a cake. Wait… cakes are the big, multi-layered things with all the frosting. Yes. I want that. Me: Cake. Not pie. Cake. Ok.
Me: Hey Simon! What do you want for breakfast? Me: You mean muffins, right? Simon: Ooh yea. Muffins. Yeaaaaah. They have the same shape! It’s confusing. Ok… maybe these two conversations are a bit of an exaggeration. But seriously friends… they’re not that much of an exaggeration. This happens to me, and I don’t see an end in sight. Very funny God. Luckily I have a very keen sense of humor too. Ha. Perhaps making up for his mix-ups, Simon is one hell of a cupcake decorator. Seriously. 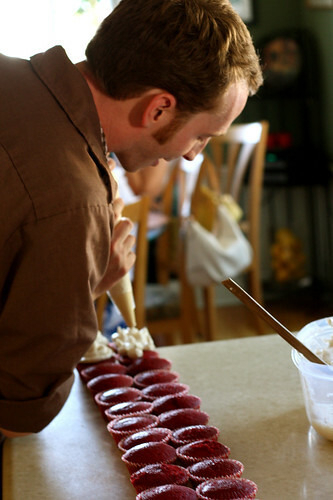 Now, I’d like to introduce you to my absolute favorite Red Velvet Cupcake recipe with Cinnamon Cream Cheese Frosting. Wait… muffins. No, cupcakes. No… definitely cupcakes. I know this. Believe it or not, I haven’t always been the biggest fan of Red Velvet Cupcakes. I thought they always tasted, well… red. 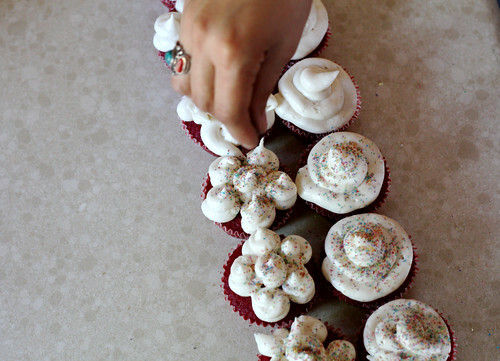 This Red Velvet Cupcake recipe comes from The Hummingbird Bakery Cookbook. 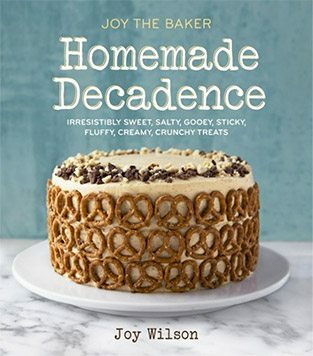 All of the cupcakes I’ve tried from this book so far have been a tremendous success. What makes this recipe so lovely, is the hearty but not overpowering amount of cocoa powder. 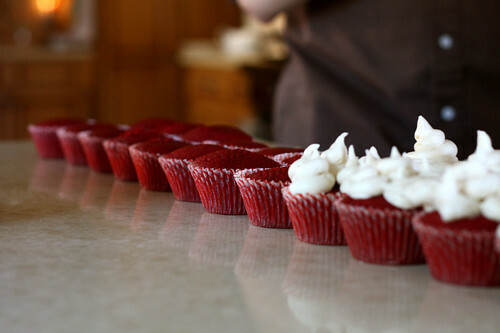 It’s just enough to tint the cupcake a sultry brownish-red and to tone down the red flavor that always turns me off. Buttermilk works to make the cupcakes just the right softness and combined with Cinnamon Cream Cheese frosting… shut up… so good! This recipe makes one dozen cupcakes. Double the recipe and you’ll have either two dozen cupcakes, or enough batter to make 2 9-inch layer cakes. Brilliant! 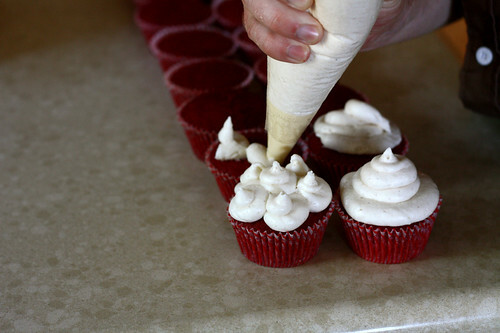 Spoon batter into a paper lined cupcake baking pan and bake at 350 F for 20-25 minutes or until a skewer inserted into the center cupcake comes out clean. Previous Post: « A Heart to Heart… Seriously, I might cry. I can’t help but go “aaawwwww.” The thought of you two in the kitchen frosting cupcakes together is just the sweetest thing. He is a keeper. What a great fish decorator. Oh, I mean cupcake. Ah, I’m so happy you’ve found a nice guy to date! Seriously, I awed outloud when I read that. Good for you! But these cupcakes are fabulous!!!!! Perfect frosting too! From this picture, Simon looks a little bit like Nick Cage. I’ll give these cupcakes a try. Nick Cage in Face Off or Nick Cage in Leaving Las Vegas? At first, I didn’t want this to be true. But after looking at some photos of him, I have to agree–indeed, we have similar eyebrows & foreheads. You got me. I’ll take it as a compliment. yay! I’d say you might have a keeper there – works wonders with that pastry bag! I can’t wait to try out this recipe too! Everything I’ve made from your blog thus far has been absolutely delicious! Really wish – really – that I had not seen this with all that cake in the fridge (I like mine super cold, but not frozen)…. ummmm, delish! Yum! These look so fantastic! My husband is a chef and speaks cookies, cakes and pies fluently but he gets dresses and skirts mixed up. Seriously. If I’m wearing a skirt he’ll say ‘nice dress’. I still mix up dresses and skirts too. I must confess. Plus, what’s a boy to do when a kilt is in the mix? Holy cow…a kilt wearer…I approve! we all understand… this is totally a safe place. ladieswear is a confusing land! My stomach is growling and my mouth is watering! I absolutely must make these soon. The thought of cinnamon cream cheese frosting has sent me totally over the edge!! I’ve been visiting this site for a quite a while but haven’t posted yet and decided that red velvet cupcakes (my favorite!) warranted a first post. Especially with the cream cheese frosting, probably would be good on carrot cake too maybe. Hehe Simon seems like a sweetheart and even though he doesn’t know the difference between a cupcake and a muffin (honestly sometimes I can’t tell the difference.. haha) you guys make a good pair. You bake the treats and he frosts them! You’re totally right! The Cinnamon Cream Cheese frosting would be amazing on Carrot Cake! Generally speaking, I’m not a fan of red velvet cake or cupcakes (no wait, muffins! ), which always depresses my husband and those Southerners in our respective families. Still, in the interest of being all familial-like, and because you said these were good, I think I’ll try these for the hubby’s birthday this year. I trust you! Yes! If anything you must try this recipe to be all familial-like!